CCI’s Blazer Brass line is here to keep you from running out of both money and ammo. This .45 Auto load uses a 230 grain bullet and produces a muzzle velocity of 845 feet per second, typical for the cartridge. Each box contains 50 rounds with Boxer primers. 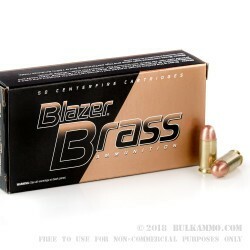 Unlike standard Blazer ammunition, Blazer Brass uses reloadable brass casings. The method used to create Blazer Brass’s copper jacket comes with several particular advantages and disadvantages. The plating covers the base of the bullet, reducing lead exposure risk. It also reduces production costs, allowing CCI to pass savings on to its customers. 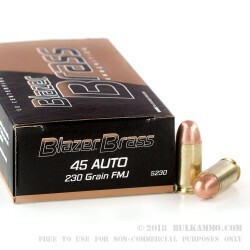 However, the plating makes Blazer Brass ammo unsuitable for use in guns with ported barrels, generally those meant for competition use. Cascade Cartridges, Inc., or CCI, is a renowned maker of high-end rimfire ammunition and economy centerfire pistol rounds. The company is located in Lewiston, Idaho, close to sister company Speer. Currently divisions of Alliant Techsystems, both companies were founded by brothers from the Speer family and continue to work closely together in developing new products. 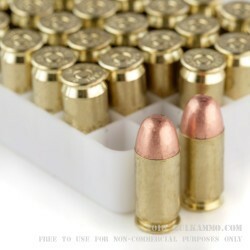 My first time doing business with BulkAmmo.com I ordered 1,000 rounds of .45 and 1,000 of .40 of the Blazer Brass. The ammo works good in any of my guns I shoot with the Blazer Brass, including a Glock 21, Sig 226, Sig 229, HK P2000, Sig Pro 2340, Springfield XD, and a Colt 1911. What impressed me more than the good quality ammo was the great customer service. When the order arrived (on time) one of the cases had been tampered with and 350 rounds (7 boxes) was missing. I immediately called BulkAmmo.com customer service and was greeted by Max, he couldn't have been nicer. He was very professional and apologetic about the situation, he explained to me the process to remedy the shortage, although I don't believe it was BulkAmmo's fault, I think someone in the shipping company stole them. Max was eager to take care of the situation and had the missing boxes replaced immediately. I own my own business and pride myself and have trained my employees the importance of "customer service". Unfortunately in this day and age not many companies or businesses put much effort into making sure their customers are happy. This may not seem to be a big deal so some people but it made me feel confident that I was doing business with a company that cares. I will absolutely be doing business with BulkAmmo anytime I'm in the need for ammunition.